First, I'm pretty new to DSLR's. I got my first one at Christmas (Canon Rebel T6 and kit) and there has been a pretty steep learning curve compared to shooting with my smartphone. This would actually be my first post to this group. Hopefully, I am posting this where it should be. That said, the day before yesterday, I was wandering around with my camera and followed a wasp. 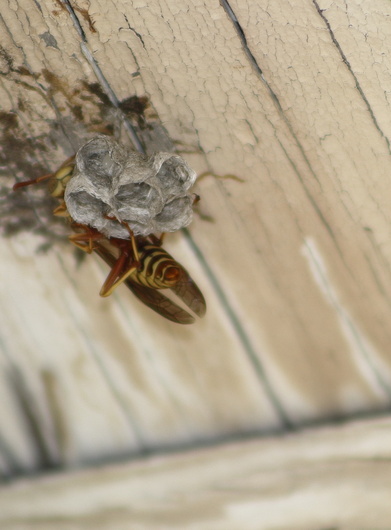 Found another wasp building a hive. Set my camera up (shot remotely via a tablet) and took a few photos. Yesterday I looked again and saw the eggs. 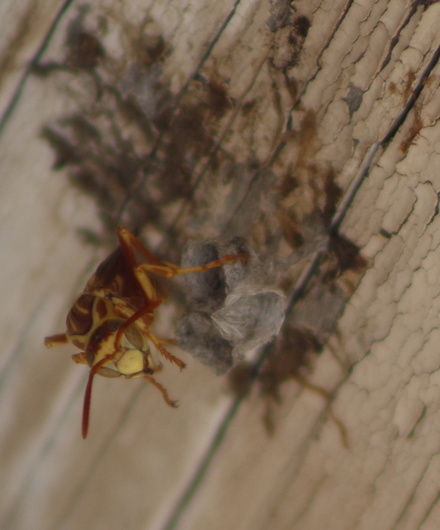 I tried to really focus on the eggs in the nest but now am wondering if the first picture was better with the nest more blurred and the focus on the wasp. I'd really love an opinion. How exciting! I love shooting bees and wasps as they have such cool, intelligent looking faces. Their great contrasty colors help too. Both of these images have some strong points. The first has a nice focus on the face of the wasp. It is a wildlife photography rule of thumb that "if it has eyes, they need to be in focus'. Of course, all rules are just guidelines but personally, this is a golden one for me. 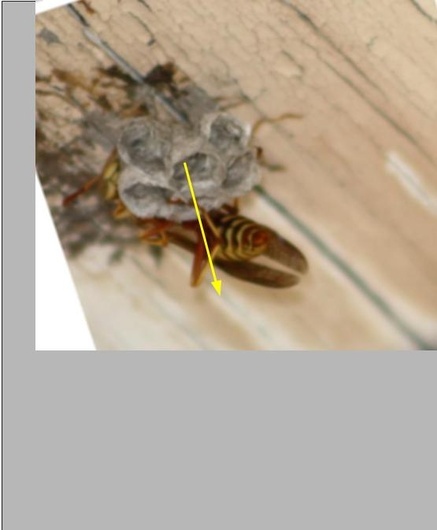 The second image has spot on focus on the nest. 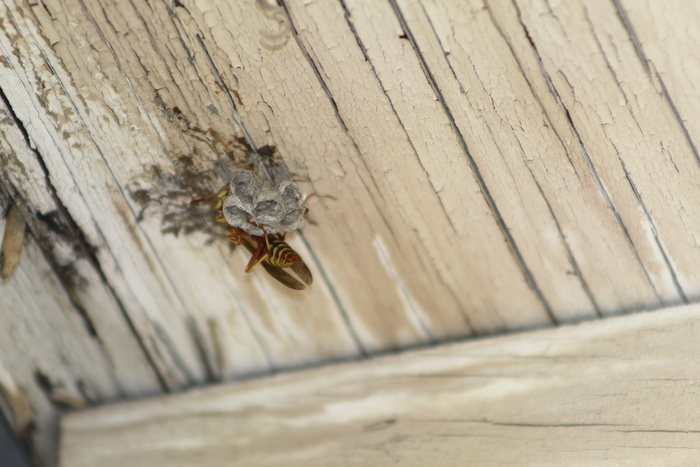 In fact, I would say that the second image is actually about the nest and not the wasp. The wasp is context but not the subject because of this. A suggestion for both images would be to try out different crops. I don't think these best suit the subjects. A second rule of wildlife photography is that the subject usually looks into the photo not out of it. 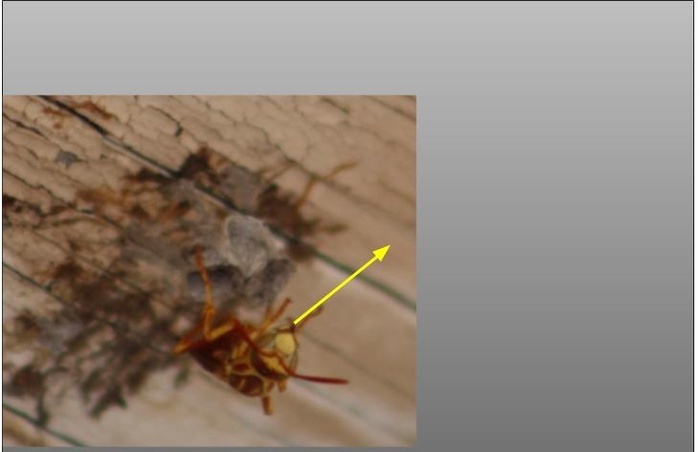 I think if you cropped the first one so that the wasp is looking into the photo and not out the bottom, and the second one in a similar manner, you will be happy with the outcome. Keep playing with your new camera! It is the best way to learn it. You are off to a great start! Best wishes! Thank you Ruthie, for your comments and advice. I really appreciate it. Just some of my thoughts on the photos, I had really liked the fact the wasp seemed to be looking at me in the first photo. I named it "I Dare You". The second, I called "In The Nest" as I wanted to feature the nest and eggs. As far as the rule of the subject looking "into" the photo, is this what you are referring too? Where the bee is looking down the length of the photo? (I am including the original picture without the crop - the original post is cropped.) I had angled the original post, trying to use the lines to give the photo more tension, it is about bees, lol. Maybe I didn't do it right? The way the nest is positioned I couldn't get to it from a different angle. There was too much stuff in the way. As it was I had to position a tall ladder with a large pan to give my table tripod some place to sit. I'm sure people thought I was nutts!! i get what you mean about the part that you liked was that he was looking at you. you can achieve this AND have him looking into the shot like this. There wasn't enough for me to crop and have it look right so I just put blank background in to illustrate the idea. the photo would fill the entire space yours + the gray. The wasp is looking in to the photo as well as looking down at you. What do you think? Oh, I see!! Yeah I would have preferred to shoot from the opposite side which would have accomplished that but it wasn't possible. Thanks for your help!! Also, here is the other one. It is just tilted a little. it is hard to see without a full crop to play with so it might not be readily understandable and for this I apologize. I was really just trying to illustrate the point. I hope this does not make things clear as mud! 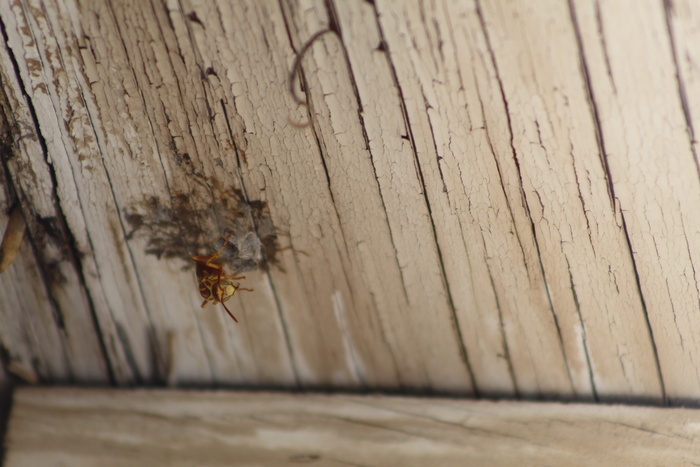 The wasp is looking right at you and the nest is oriented toward the center of the photo. Here's the original of the second photo without the crop. I think comparing your crop to my original, the original is more like what you are talking about?? Thanks for all your help!! Actually, I have a technical question. I was uploading a picture into my "portfolio" here in "FStoppers" and the photo is in portrait on my computer but when I uploaded it had been turned to horizontal. I can't seem to see where to either remove it or turn it so it's portrait. Do you have any clue? Sorry to ask an unrelated question. In your profile, hover the cursor over the photo. a little trash can should appear at bottom right. Try uploading the image again.